Taken with Olympus E500 digital camera on July 19th 2007. Click image for larger view. 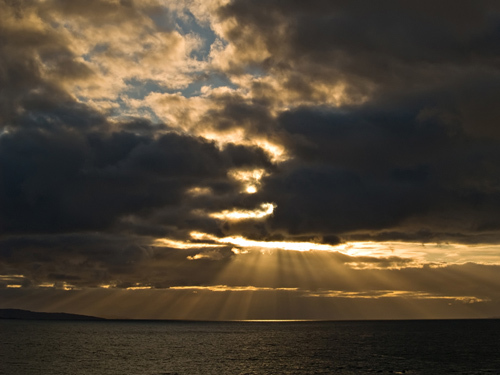 Found this view of sunbeams over the ocean to be very beautiful so had to take a picture. Love the way the sunrays comes out of the clouds. Maybe something divine is hiding behind the clouds? Love that image! I could look at that all day. Very inspiring. Yeh it looks like something divine … kinda creepy haha. Nice pic! Isn’t it great when everything just seems to come together for a shot like that? That is one of those that come rarely to a person, especially when they happen to have a camera handy. another tremendous shot. thomas, you are very skilled! Magnificent. Simply magnificent. As a believer I can only be in awe at the work of the Lord’s mighty hands. Got over here from my blog log, glad I did these photos are awesome. Shaun: Lol, have you been sinning? BobG: I try to carry with me my camera as often as possible. Marisa: Hehe, I will next time you visit Norway! Stumbled over here from MyBlogLog Thomas. Glad I did as you have some wonderful photos and are quite talented. In fact I will be in Norway and the Land of the Midnight Sun next week… hoping to see some of the wonderful scenery you have prepped me for. Beautiful photos of Norway. You have an eye for the beauty around you. It takes talent to frame it properly to show it off to its best advantage and you have that.